Following closely the campaign of the Tim Laidler, the Conservative candidate in the newly established riding of Port Moody-Coquitlam, I have been puzzled as to why Mr. Laidler has seemingly insisted on downplaying his extensive past political experience as it seems to me that when you are running for political office, that one’s past political experience is highly relevant. 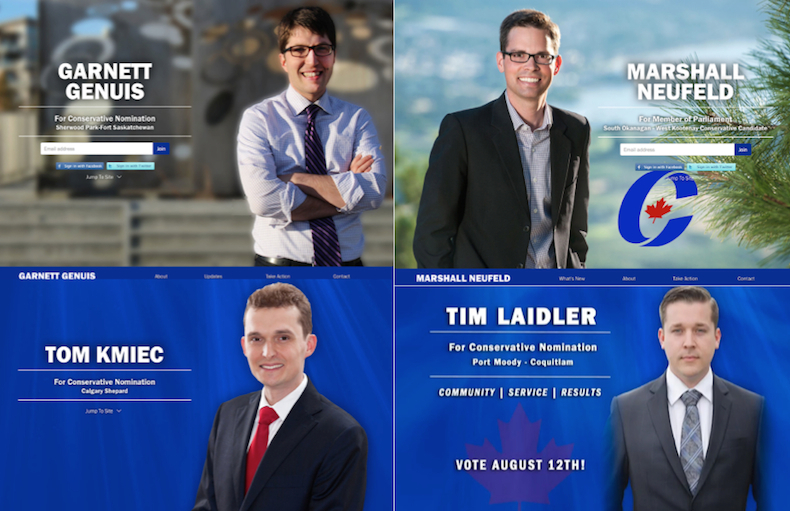 Instead, Mr. Laidler doesn’t appear to acknowledge any of his past political activities or connections in any of his bios, on his campaign website, or in any of the campaign materials. I think that I finally may now know why. As a backgrounder, according to Tim Laidler’s Linkedin profile, from September 2011 to March 2014, Mr. Laidler was a Board Member of the NPA (Non-Partisan Association) in Vancouver. Below is a photo taken from a November 15, 2013 Georgia Straight Article showing Mr. Laidler at the announcement of the NPA candidates for the last civic election. Mr. Laidler is quoted in the article. Provincially, Mr. Laidler also worked extensively for the B.C. Liberals under Christy Clark during the last Provincial election, working as the campaign manager for Fatima Siddiqui, the wife of fellow NPA Board of Director and fellow former Alpha Delta Phi alumni Tanveer Siddiqui, in the riding of Vancouver-Hastings where Ms. Siddiqui managed to finish a distant second in the riding, garnering approximately 28% of the popular vote in comparison to Shane Simpson of the NDP who took the riding with almost 59% of the vote. 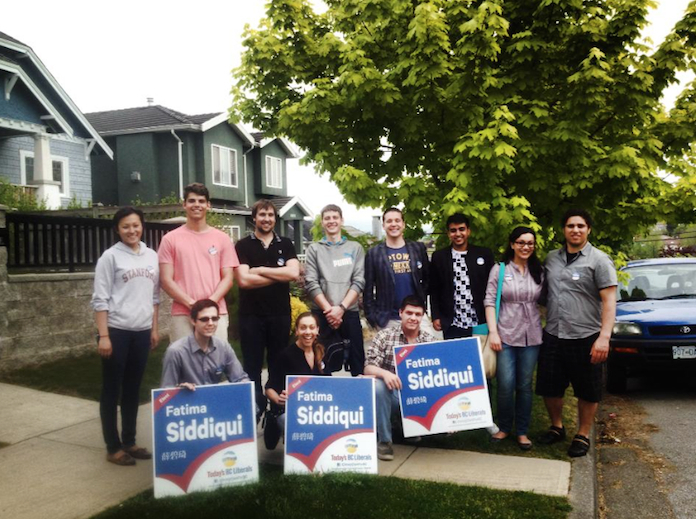 Below are a few photos of taken of Mr. Laidler out campaigning for Ms. Siddiqui in the riding of Vancouver-Hastings during the last Provincial election. 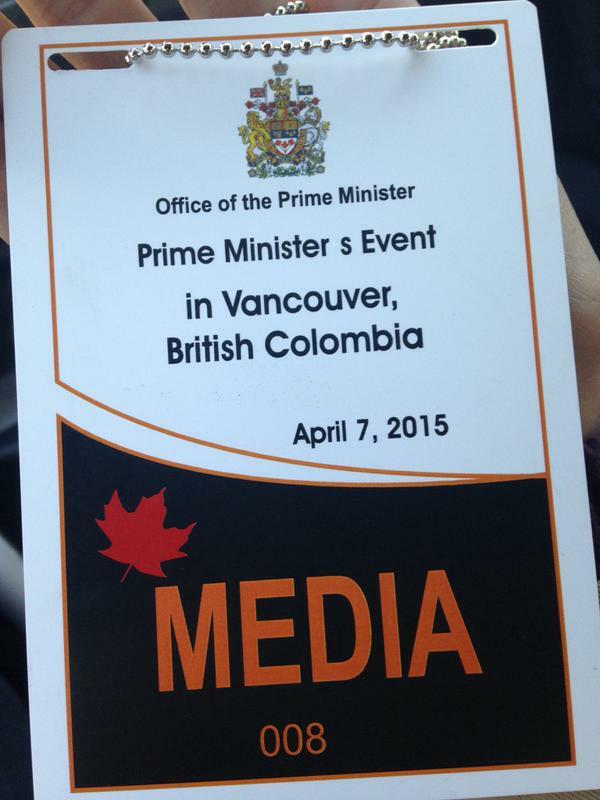 Mr. Laidler also worked as an event coordinator for the B.C. Liberal party for a year in 2009. 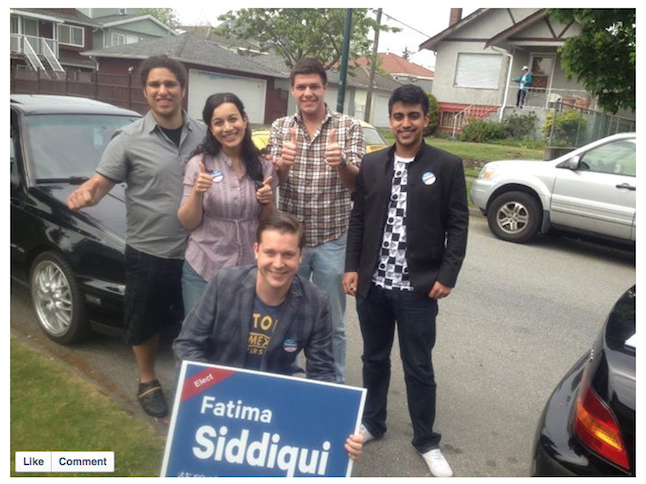 Mr. Laidler campaiging for BC Liberal Candidate Fatima Siddiqui in the riding of Vancouver Hastings. Mr. Laidler interestingly also seems to be quite connected politically to former Mayor, former NPA member, and current B.C. 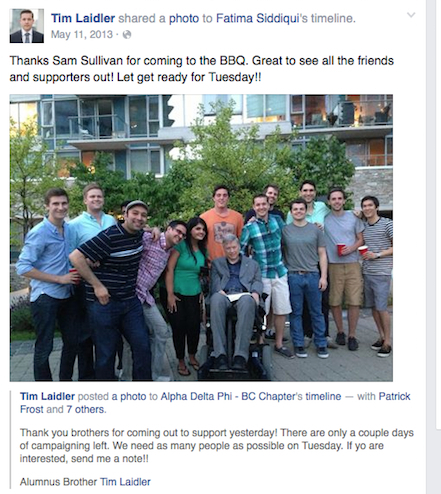 Liberal MLA for Vancouver-False Creek, Sam Sullivan. Below is a photo of Mr. Laidler at a BBQ in honour of Candidate Siddiqui which was attended by Mr. Sullivan. Mr. Laidler also spoke Sam Sullivan’s Public Salon in September of 2012 and was one of the organizers of the “City Social” event put on by the NPA in 2013 at which Mr. Sullivan spoke. A review of the recently disclosed candidate financial statements associated with his campaign for the Conservative nomination in the riding of Port Moody-Coquitlam I believe finally provide clues as to the reasoning behind Mr. Laidler apparent desire to downplay his past political connections. The original raw documentation can be found here. Rather than reproduce the documents verbatim, I have chosen to highlight some selected information. 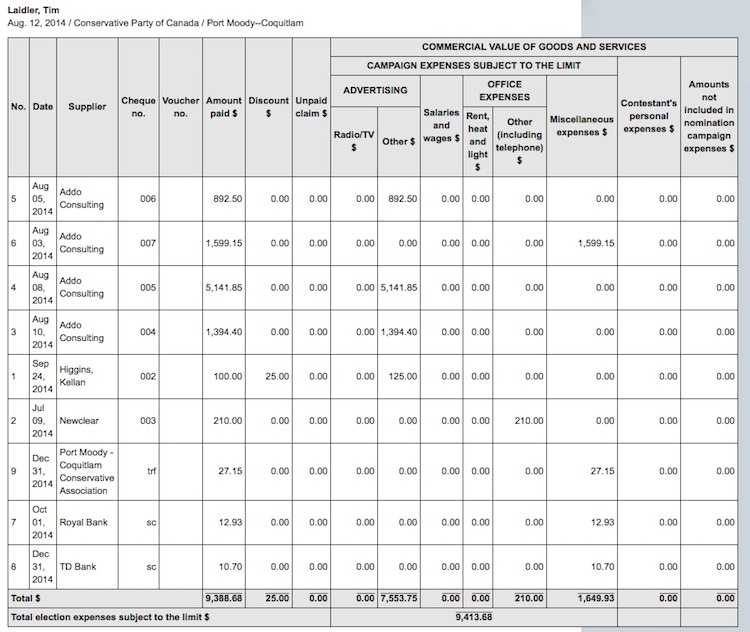 In regards to Mr. Laidler’s declared expenses arising from the nomination campaign, notable expenses include payments totalling $8,135.40 (representing 86% of the total expenditure of $9,413.68 incurred during the campaign) to ADDO Consulting with the remaining expenses being split between by what appears to be a photographer, Newclear (for a website template I’m sure, seen below confirming the earlier speculation here), his EDA, and two banks. Who or what is ADDO Consulting you might ask? A quick Google search confirms that the Principal of ADDO Consulting is in fact Mr. Gavin Dew (see below). From the expenses noted, it appears that Mr. Dew was presumably working as Mr. Laidler’s campaign manager during his nomination campaign and took care of almost everything for Mr. Laidler. Mr. Dew, for those who are not familiar with him, is according to his Linkedin profile, a communications specialist who’s “sweetspot is at the intersection of business, politics, and communications”. He specializes in “business and communications strategy, public relations, corporate communications, political campaigns, analysis, business development, community building, next-generation leadership.” Mr. Dew is “currently consulting on issues management, social license to operate for land development and resource companies, and business planning for startups and fledgling organizations”. As such, Mr. Dew is currently working as a consultant working on the Trans Mountain Pipeline Expansion project for Kinder Morgan working on stakeholder engagement and communications for the project. Mr. Laidler and Mr. Dew in fact go way, way back (back to even his UBC days I suspect) with them both being former directors of the Non-Partisan Association (NPA) at the same time (see photo below). 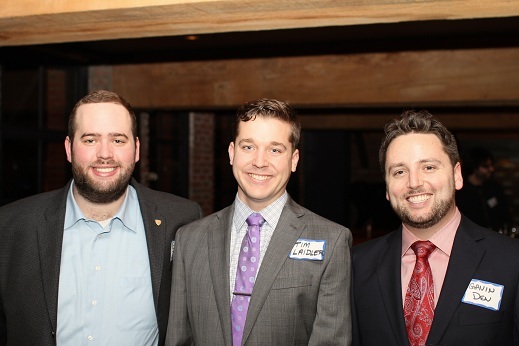 NPA Under 40 Chair, Eli Zbar, with Board Member, Tim Laidler and Gavin Dew in an image from 2012. Mr. Dew was in fact described as the NPA’s former Social Media expert, and was part of former Premier Gordon Campbell’s constituency campaign, and along with Tim Laidler, was a founding member of the group known as the Build 2030 Public Engagement Society, a group loosely associated with the B.C. Liberals which was described as “a not-for-profit group which caters to what it calls the next generation of movers and shakers”. 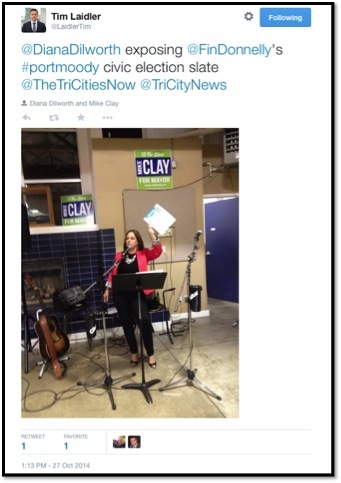 Mr. Dew, like Tim Laidler, was also a campaign manager for the B.C. Liberals running a successful re-election campaign for Ralph Sultan in the riding of West Vancouver-Capilano. Clearly, there are many parallels between Mr. Dew and Mr. Laidler’s political careers. Additional details concerning Mr. Dew and his and Tim Laidler’s apparent ties to the Tar Sands Industry can be found here. 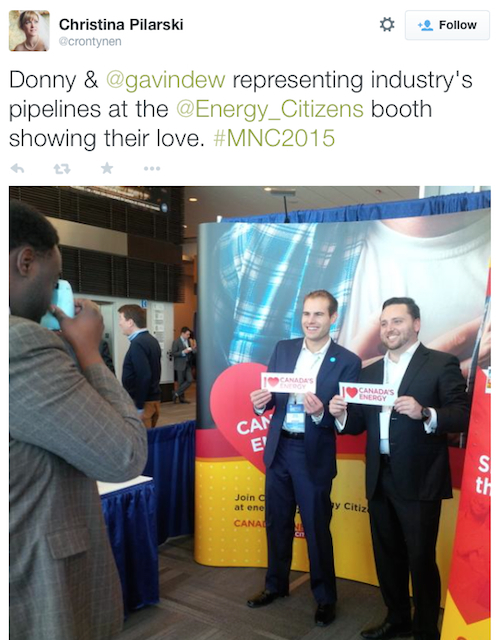 Tweet from the Manager of the Campaigns [Christina Pilarski] for the Canadian Association of Petroleum Producers (CAPP) showing Donny Mr. van Dyk [Northern Gateway project] and Mr. Gavin Dew [Trans Mountain Pipeline Expansion project] [“the pipeline guys! !”] at the 2015 Manning Networking Conference. 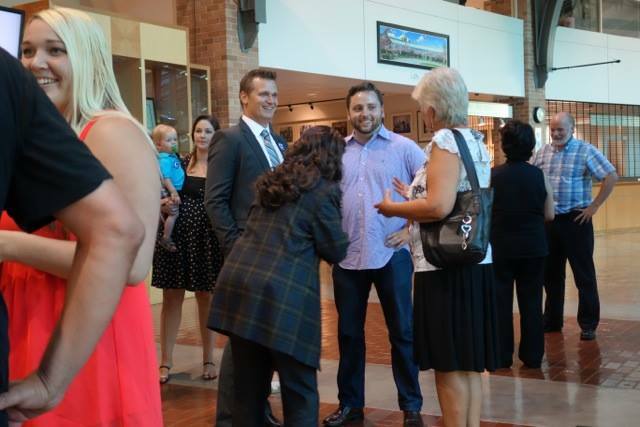 Tim Laidler (left) and Gavin Dew (right) waiting in the receiving line to meet Christie Clark after her speech at the 2015 Manning Networking Conference in March. Those long time followers of the blog may remember that in an earlier post here that there was speculation that Gavin Dew was in fact Tim Laidler’s campaign manager for his nomination race. The former appears to be confirmed. Not sure if he is the current campaign manager for the election though however. That actually remains to be established but given the recent gaff regarding the photoshopped campaign sign (see below), I sure for his sake hope not as I can’t imagine that someone as experienced as Mr. Dew would have let anything with Mr. Laidler’s name on it get out of the office without first reviewing it. 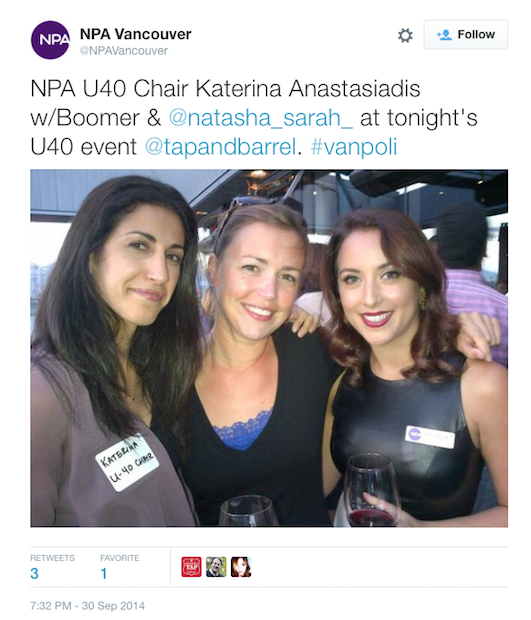 Also notable on the candidate’s financial filings is that the Mr. Laidler’s financial agent is identified as being Katerina Anastasiadis (see below), a former director and Under 40 Chair for the NPA, who was also a director and on the NPA executive at the same time that Tim Laidler. Again another NPA connection. Reviewing the actual campaign contributions themselves, there were a total of 41 contributors to Mr. Laidler’s nomination campaign. Of those 41 contributors, 29 individuals contributed less than the $200 reportable amount and 12 individuals contributed more than the reportable $200 amount. Below is a table summarizing the individual reportable contributions over $200. Mark Angus: the former Vice President of the NPA and a current board appointee to the NPA. Interestingly, Mr. Angus appears to be a prolific supporter of the Federal Liberal Party having contributed to the Federal Liberal Party, the campaigns of Justin Trudeau and Hedy Fry, as well as to various Liberal Party constituencies numerous times over many years. 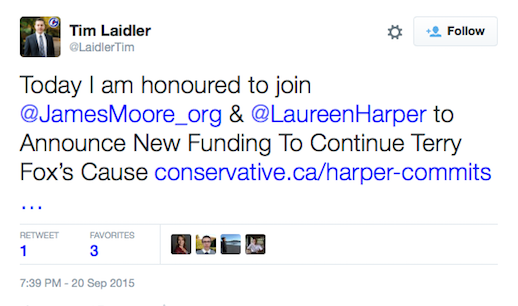 The only donation to the Conservative Party appears to be that towards Tim Laidler’s Conservative nomination campaign. David Bassett: A former Conservative riding association president. Greg D’Avignon: An apparent friend of MP James Moore, who is currently the President and CEO of the Business Council of British Columbia, and who is a strong proponent of resource extraction projects and pipeline developments with a focus on expanding Far Eastern economic trade relationships. Interestingly, Mr. D’Avignon is, like Tim Laidler, also a fellow Diamond Jubilee Award winner. He received his medal at the same ceremony as Tim Laidler (presented by James Moore). 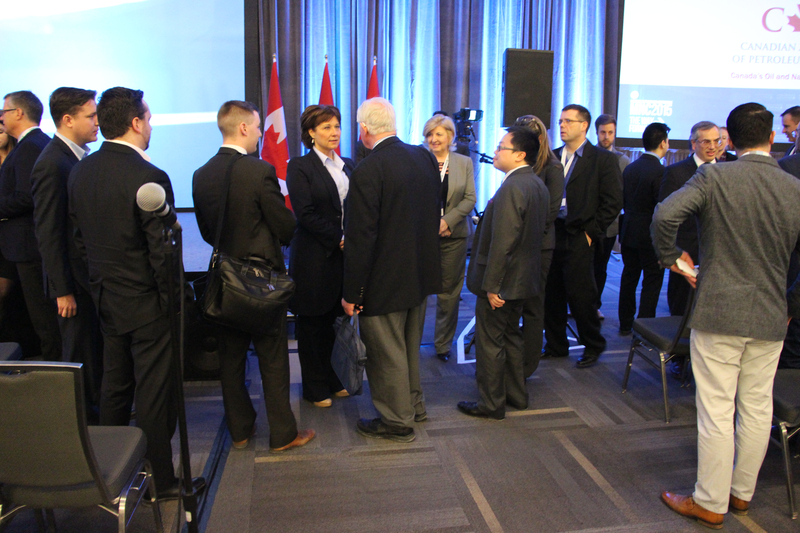 He also notably spoke at a North Vancouver Chamber of Commerce event sponsored by Kinder Morgan/Trans Mountain Pipeline project with a number of representatives present including Gavin Dew. Foster Eastman: Who appears to be a friend of Mr. Laidler’s, a multimedia artist who created the tribute pole project that Tim Laidler and other veterans participated in as documented here. George Hungerford: a prominent Vancouver lawyer. Michael Korenberg: the Deputy Chairman and Managing Director for the Jim Pattison Group. Tanveer Siddiqui: A current director of the NPA and a fellow past NPA Board of Director and fellow former Alpha Delta Phi alumni who was on the NPA board with Tim Laidler during his time as a director with the NPA. As noted previously, Tim Laidler worked as the campaign manager for Fatima Siddiqui his wife during the last Provincial election. And lastly, Sam Sullivan, the Former NPA Vancouver Mayor, who’s only other recorded Federal campaign contribution other than to Tim Laidler’s Conservative nomination campaign has been to the Federal Liberal Party and Michael Ignatieff. A few things about this list that should be pointed out. First, for a supposedly local candidate with deep local roots and ties to the community, other than his Mum, only 1 of his other 12 major contributors (those who contributed more than $200 to his campaign and therefor reportable under the Elections Act) actually resides in the riding of Port Moody-Coquitlam. 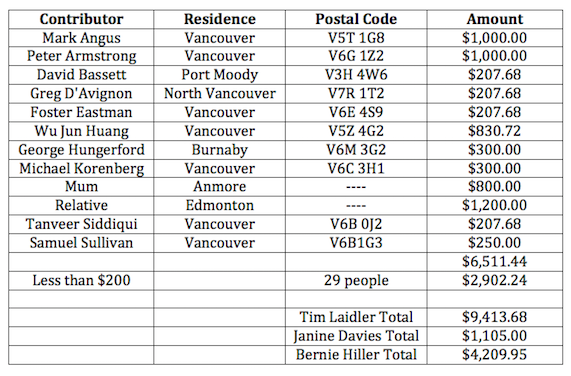 Moreover, all of the remaining 10 identified contributors reside well outside of the riding, primarily in Vancouver. This one could argue would be exactly the pattern that one would expect if one was a parachuted candidate who only recently moved back into the riding (by his own admission) rather than a candidate with deep local ties and extensive local support. Moreover, being considered an outsider might also explain why despite outspending his rivals by approximately 2:1 (Bernie Hiller) and 9:1 (Janine Davies) margins respectively, that Mr. Laidler still did not win the nomination until the third ballot. 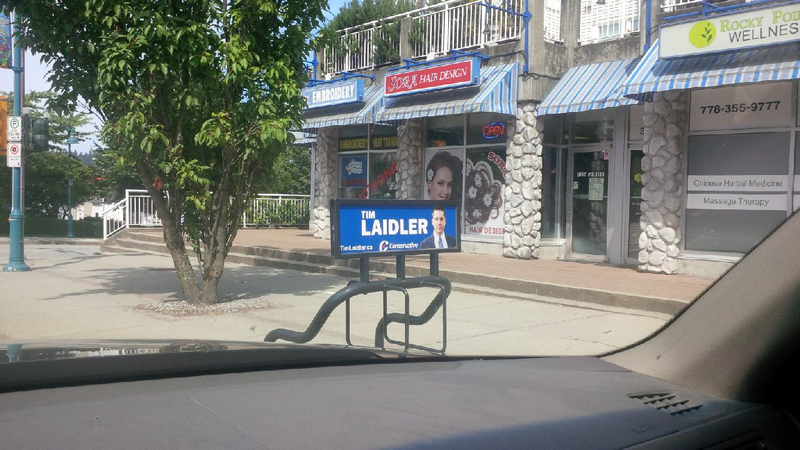 Perhaps being away from the riding so long made it difficult for local residents to remember Mr. Laidler? I’m not sure. Also notable of course, as you may have noticed, is that four of 12 contributors identified to his nomination campaign (specifically Mr. Angus, Mr., Armstrong, Mr. Siddiqui, and Mr. Sullivan) all have direct demonstrable ties to the NPA party, this being over and above the demonstrated ties to the NPA of both his presumed campaign manager (Gavin Dew) and his campaign financier Katerina Anastasiadis. So why downplay the NPA associations and your past political ties you may ask? He was a Director of a major political party for goodness sake! Well for one thing, being associated with the NPA may not be considered much of a positive politically these days. 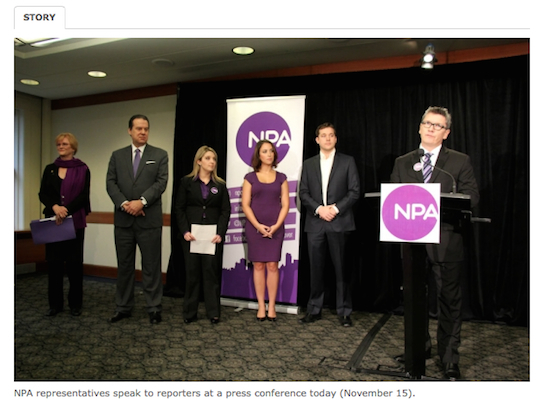 After all, this is the same NPA that was the subject of a defamation suit that was recently dropped after the NPA apologized, that was accused of spreading false personal rumours regarding Mayor Robertson during last mayoral campaign, and has been on a losing streak, losing the last two civic elections in Vancouver in a row. Could it possibly be that being associated with the NPA and/or the BC Liberal Party could possibly be seen as a possibly detrimental to Mr. Laidler’s candidacy and being elected in the riding of Port Moody-Coquitlam given the recent influx of former Vancouver residents moving to the riding especially in the denser parts of Port Moody? Maybe so. Composition of the NPA Board in 2014. 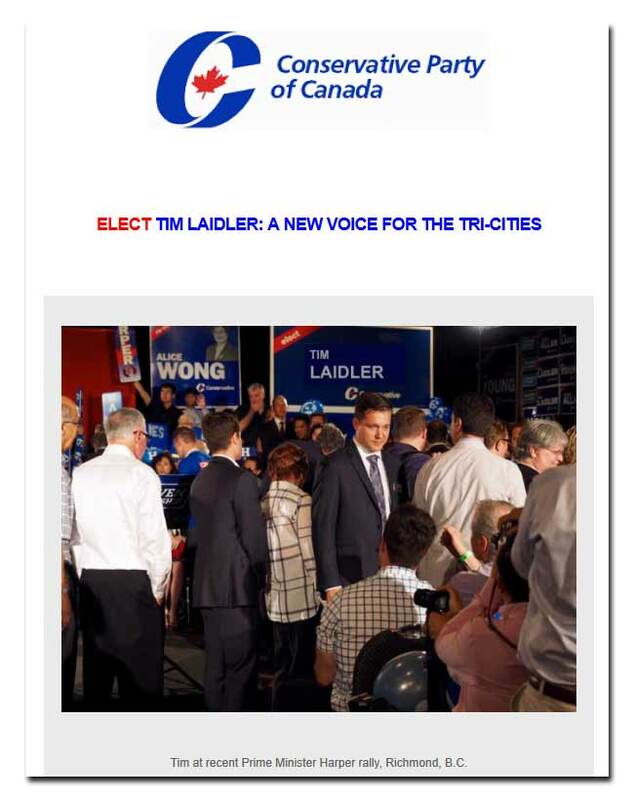 Note the number of familiar names associated with Mr. Laidler’s nomination campaign. Could it also be that acknowledging your past political experience could bring attention to that fact and might lead someone to research those connections? Possibly. 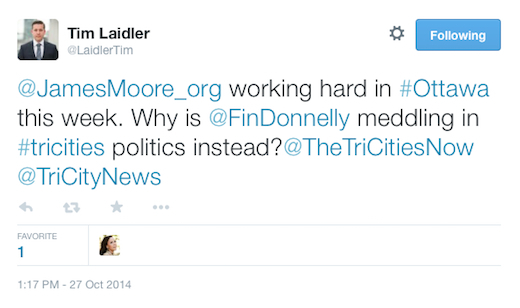 Researching those connections could lead one to the inevitable conclusion that there is in fact quite an extensive association between Mr., Laidler’s current campaign and the NPA in Vancouver, something as an allegedly local candidate that he would understandably want to downplay. Lastly, could it also be that acknowledging these past political accomplishments and connections does not fit the narrative that Mr. Laidler and his campaign are trying to portray: that of the selfless soldier wanting to pay back the community and support the Conservative government after the treatment that he had received from them while in the Reserves and the support that he had received from them as a Director of the Veterans Transition Network (VTN). Instead, as mentioned previously elsewhere, it is abundantly clear that Mr. Laidler is in fact a highly connected right wing politico who just happens to be a Veteran and as such, he fits perfectly within the Conservatives plans to counter criticism regarding their treatment of Veterans under Harper’s regime while at the same time representing the new young face of the Conservative party, a party that is gradually greying and has largely tapped out their immigrant and minority support as suggested here previously. It could very well be argued that Mr. Laidler would have been a far more appropriate candidate for the riding of Vancouver Quadra given his long-term residence in the City of Vancouver, his extensive experience at UBC, and his familiarity for the politics in the City of Vancouver at both the Civic and Provincial level. One wonders why Mr. Laidler didn’t choose to run in that riding or some other riding in the City of Vancouver rather than in Port Moody-Coquitlam as he clearly has (as one can see from the preceding) more ties politically to Vancouver? Was it that he thought (or others thought for him) that he would have an easier time getting elected in Port Moody-Coquitlam rather than in Vancouver Quadra or some other Vancouver riding? Did he perceive (or others perceive for him) that it was going to be too difficult for Mr. Laidler to defeat Federal Liberal incumbent Joyce Murray or some of the other incumbents so instead it would be better for him to go “back to his roots”, a place that he hasn’t resided in for many, many years? Difficult to say. 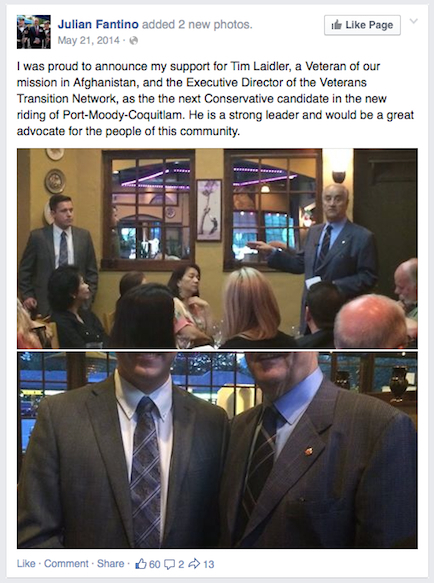 What is clear though is that by not acknowledging his past political connections and his past political experience that Mr. Laidler is not being forthright with the constituents of the riding of Port Moody-Coquitlam. It come down to a question of trust. One has to wonder, if Mr. Laidler is guarded with this type of information, why would we suspect that he would do any better if he were elected to Ottawa? Should we as voters trust him? As pointed out here and many, many other places elsewhere on this blog including here and here, Mr. Laidler’s lack of transparency is a constant theme associated with his campaign. I can only hope that voters in the riding of Port Moody-Coquitlam will be able to see through the opportunistic candidacy of Mr. Laidler and vote for someone else (whomever that might be). The constituents of Port Moody-Coquitlam deserve a representative in Ottawa working for us not a Harper representative in our riding working for him. Today (August 20, 2015) I became aware of what appears to be first poll results from the riding of Port Moody-Coquitlam. The poll, which was apparently commissioned privately by the group Leadnow and conducted by Environics, took place between August 15-18. The summary results of the poll are posted on their website here (and reproduced below). Details concerning the poll can be found here. The results suggest that the NDP’s Fin Donnelly is currently leading in the riding with 54% of the decided vote, followed by the Conservatives’ Tim Laidler in second place with 27%, the Liberal’s Jessie Adcock with 14%, and the Green Party’s Marcus Madsen with 5%. 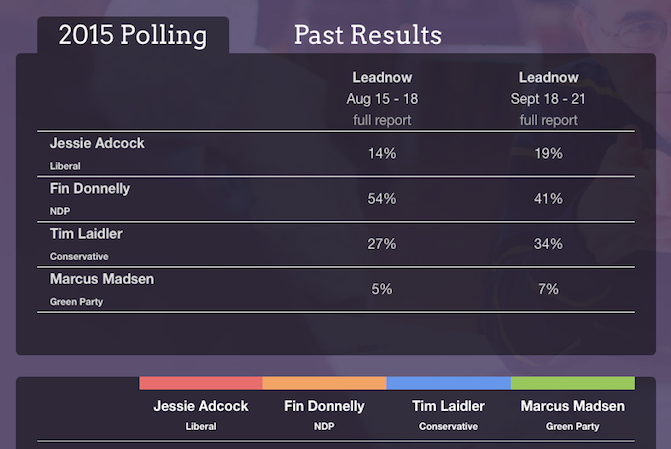 These values are interesting as they largely mimic the projections provided by ThreeHundredEight.com (reproduced below) which suggest that the NDP’s Fin Donnelly is currently leading in the race with a median estimate of 45% of the vote (range 43.2% – 48.7%) followed by the Conservatives’ Tim Laidler with a median estimate of 32% (range 30.4% – 35.2%), the Liberals’ Jessie Adcock with a median estimate of 16.5% (range 14.9% – 17.7%), and the Green Party’s Marcus Madsen with a median estimate of 5.4% (range 4.9% – 5.8%), and “other” with an estimate of 1.1% (range 0.4% – 1.3%). The ThreeHundredEight.com website currently estimates that there is a 78% chance of a NDP win in the riding. 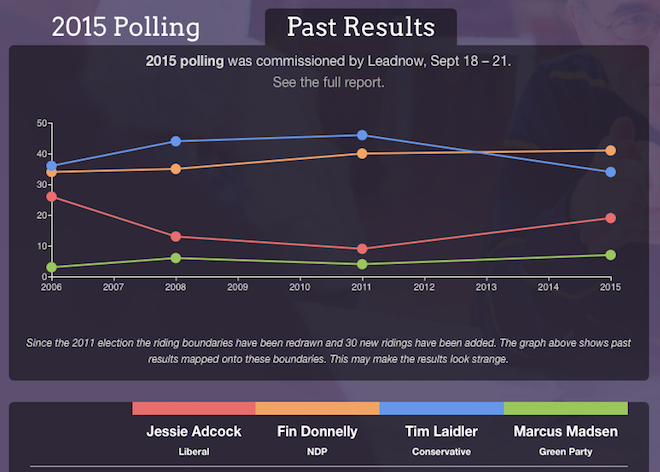 A NDP win for the riding is also the predicted result according to the ElectionPrediction.org website. Now, a few caveats must be expressed about the Leadnow poll results and the projection provided by ThreeHundredEight.com. First of all, it must be remembered that we are still very, very early in the campaign with almost none of the candidates having quite yet hit their stride campaignwise. 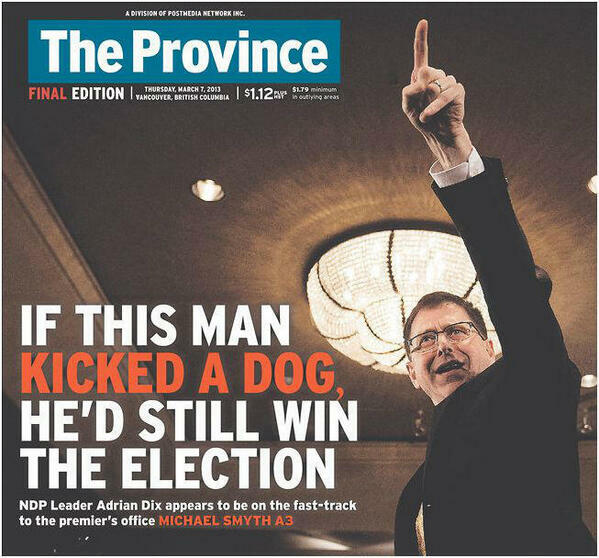 Moreover, as a local pundit will I’m sure be quick to point out, we have the experience in our recent memory locally where the polls were decidedly incorrect (cast your mind back to the Province headline that said Adrian Dix could kick a dog and still get elected below). Past experience has shown us that campaigners on all sides should not be complacent in regards to the polling result provided by Leadnow and/or the projection put forth by ThreeHundredEight.com as we still have a long, long way to go in this race. 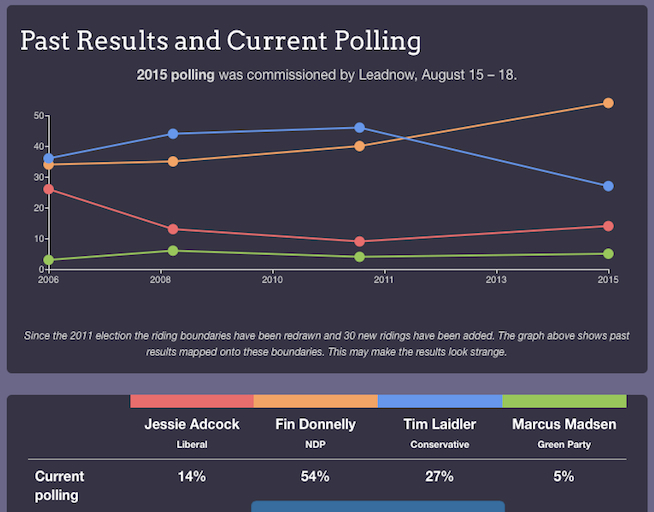 That said, the Leadnow poll results and the ThreeHundredEight.com are useful in themselves as they at the very least, provide a baseline from which subsequent polling results may be compared and evaluated. Edit: A second Environics poll conducted Sep. 18-21 was recently published for the riding and can be found here. The second poll shows the NDP dropping by 13 points but still maintaining a 7 point lead over their nearest rival the Conservatives, who gained 7 points and are now sitting at 34% according to the poll. The Liberals increased their support by 5 points and are now sitting at 19% while the Greens have increased their support by 2 points and now sit at 7%. Overall the results indicate the same relative placement in terms of the standings in the race and an overall tightening of the race. At the same time, the poll also suggests that a substantial undecided vote still remains. One must remember that this second batch of polling data would have taken into account the NDP Syrian refugee controversy with the effects of that now being factored in. Conversely, the poll took place before the Conservatives’ politicization of the Terry Fox announcement, which will likely affect the local Conservative vote, especially amongst right-leaning swing voters. Most recent polling data projected against 2011 results. The above graphic displays the most recent results plotted against the results from 2011 showing a slight increase in NDP and Green support from 2011, a drop in Conservative support since 2011, and an increase in Liberal support since 2011. My prediction? Looking forward and barring any major gaffes, I am expecting a strong surge in Liberal support in the riding given the recent performance of the Liberals nationally and as such, in my opinion we are very likely to see a split on the right in the riding with a fairly substantial core NDP vote in Coquitlam augmented by a core NDP support in Port Moody/Anmore likely carrying the day. On the right, the two Port Moody/Anmore-based Liberal and Conservative candidates will likely split the vote in what has traditionally been a Conservative area. That said, irrespective of what happens in Port Moody/Anmore, it should be remembered that Coquitlam numerically dominates the Port Moody/Anmore area so ultimately whoever carries Coquitlam will likely, as I say, carry the day and at least for the moment, for various reasons, it appears that that likely will be the NDP. Only time will tell of course. Just ask Adrian Dix. A couple of items recently came to my attention following the recent all-candidates meetings in the riding of Port Moody-Coquitlam this past week. While I could have added this items to the A Campaign to Forget Post, I thought that they warranted a post on their own. First, Conservative candidate Tim Laidler’s comments from the recent Chamber of Commerce Debate concerning his observations of marijuana usage in University made Robert Jago’s video “Conservative Candidates Share Weird Views About Marijuana”. 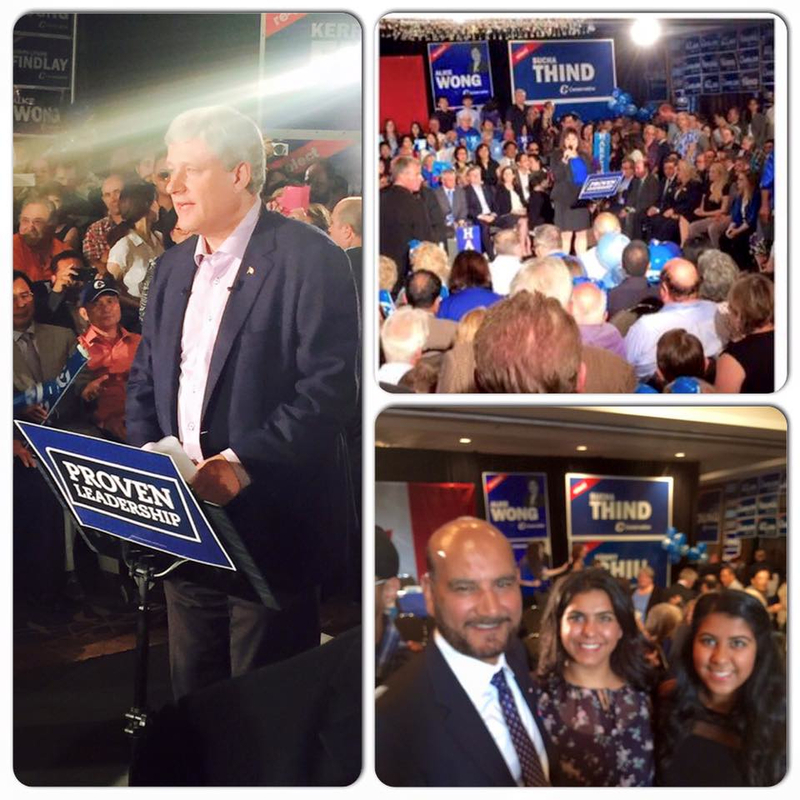 Robert Jago you may remember is the blogger who runs Meet the Harper Gang Website, a valuable resource for those interested in researching the quality of the Conservative candidates these days. Mr. Jago also you may remember posted materials that lead to the dropping of two Conservative candidates. 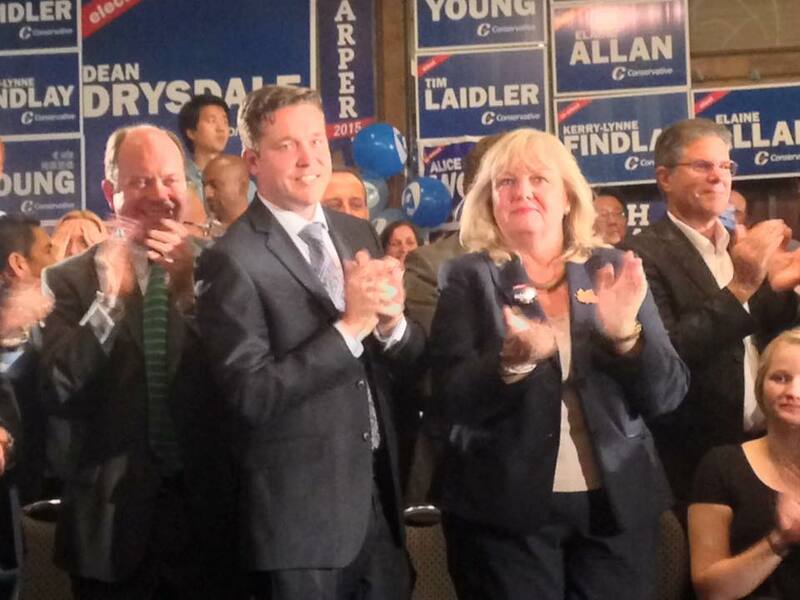 Recently an article was published by the National Observer alleging connections between Mr. Laidler’s nomination campaign and a consultant for Kinder Morgan. The article can be found here. This article subsequently inspired a petition and action campaign by the group SumOfUs that can be found here. SumofUs also initiated a radio campaign which has been the subject of objections from Mr. Laidler’s campaign. Below is a screen shot of the top of Sum of Us page. Subsequent to the publishing of the letter to the editor in the Vancouver Sun, this table (which contained numerous factually incorrect and inflammatory comments/statements) was sent to Conservative supporters in the riding. Where exactly does it say on the NDP platform that they are against all resource developments? What page is that on? Which specific vote in Parliament was regarding Evergreen line funding you may ask? etc., etc. I could go on but it is somewhat pointless at this point. 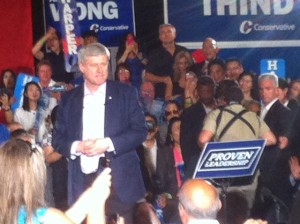 Apparently exaggerations and inaccuracies are just a routine part of the Conservative campaign strategy locally. 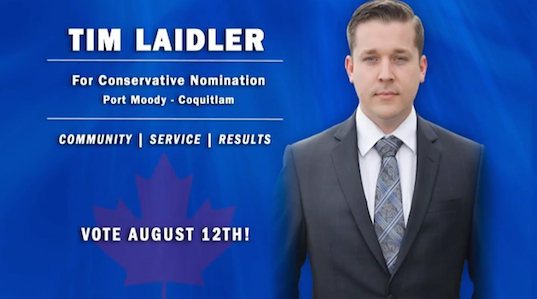 It has been in many ways a campaign to forget for Tim Laidler, the Conservative candidate in the newly-established riding of Port Moody-Coquitlam. 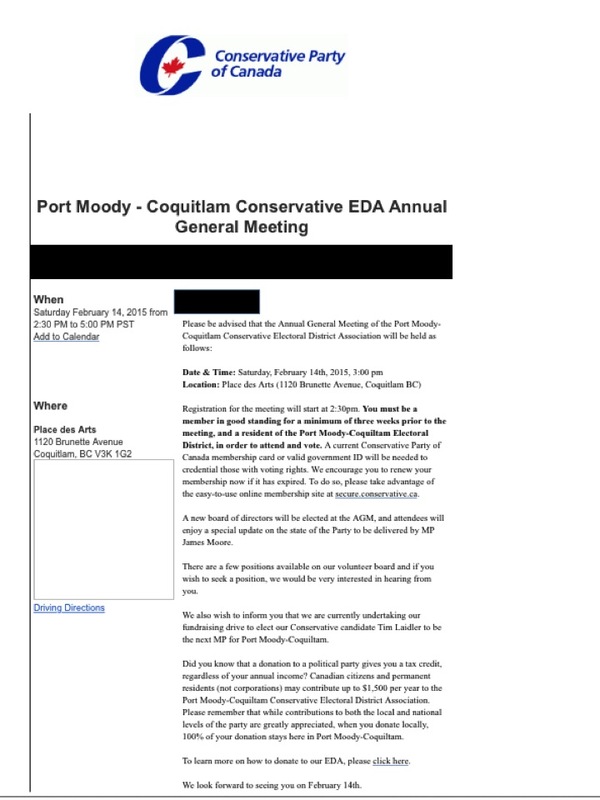 First, there was the notice of the Annual General Meeting for the riding of Port Moody-Coquitlam in which the name of the riding was repeatedly misspelled). Then there was the page on the Turf Mark Holland website (TMH2.org) that posted a webpage encouraging support for Mr. Laidler (likely without his knowledge) that by implication associated him with some of the more extreme elements of the anti-gun control lobby (reproduced below and since deleted) since those with moderate views do not tend to garner endorsements and support from these kinds of websites. 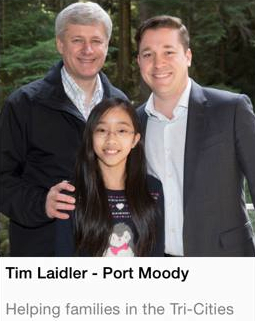 Then there was the use of this very awkward and cringeworthy picture that appeared as part of a sponsored ad on Facebook showing Mr. Laidler with Steven Harper and a young Asian girl with the ad talking about families yet there is no family in the shot. Awkward. Then there was the revelation that prior to retiring from the military, that Mr. Laidler’s candidacy for the Conservatives was possibly in violation of the DND and CF Code of Values and Ethics. Then there was this campaign sign that was put up on Aug. 1, 2015, the day before the writ was actually dropped, advertising a candidate for an election that hadn’t been called yet in a riding that didn’t exist yet. 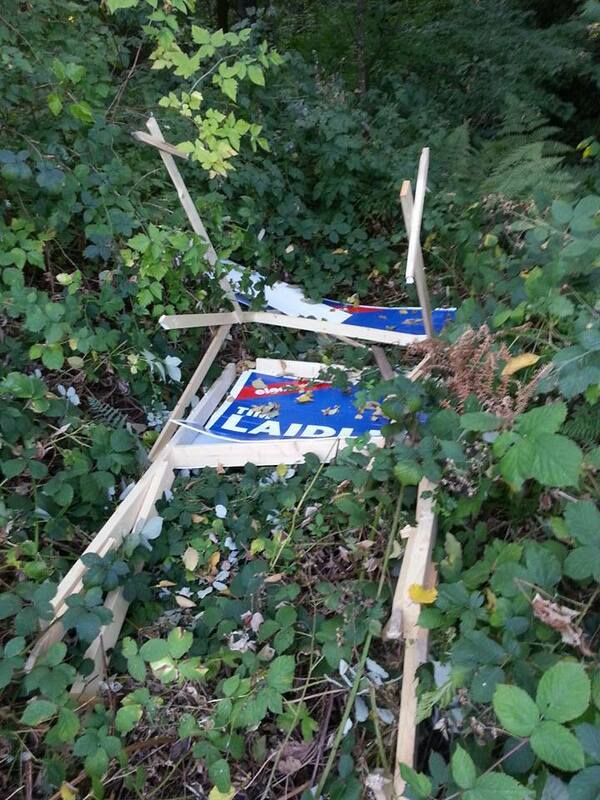 Then after the campaign signs went up, Tim Laidler’s campaign signs were apparently intentionally targeted and the subject of repeated vandalism. Then there was the campaign office location selection gaffe where the choice of the campaign office location lent itself to some embarrassing sign placements by rivals. Then there was the badly photoshopped sign that appeared in internal riding party propaganda which leaked out and became the subject of subject of local and national media posts (see here and here) as detailed in the post here. Then there was the Terry Fox funding announcement/photo-op gaffe with James Moore and Laureen Harper which I’m sure all sounded good originally but then went horribly wrong where Mr. Laidler’s mentor James Moore was caught incorrectly stating that the Fox Family was fully supportive of the funding announcement stated in reference to the Fox Family, that “They’re enthusiastic and they think it’s great.” Mr. Moore then doubled down on his apparently incorrect statement a full 17 hours later on his personal Facebook account after Mr. Moore had more than ample time to reconsider his words after initially being questioned about the nature of the Fox family’s support for the announcement (see below). Subsequently, the Terry Fox funding announcement was of course widely criticized by the Fox family and others as well as local media and editorial boards, with many lamenting on the brazen Conservative politicization of the Terry Fox Foundation’s campaign. 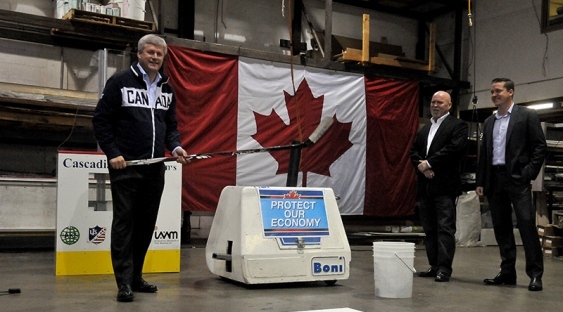 Then there was the rather odd photo-op in Port Moody at which no member of the public was allowed to attend and to which only a few select media were invited. A missed opportunity it seems. However, given that it was only a few days after the Terry Fox Foundation announcement gaffe, I suppose that is understandable. Then there were the gaffes at the recent Chamber of Commerce all-candidates debates including when Mr. Laidler suggested that he had had friends in University that had tried marijuana and ended up in the Psych Ward (as seen at 12:10 in Part II). In the same debate, Mr. Laidler inexplicitly felt the need to try to refight the last Port Moody civic election (of all things) by bringing up (repeatedly at 3:14 and 6:00 in Part II) the accusation that Fin Donnelly had run a slates of candidates in the civic elections in Coquitlam and Port Moody and had meddled in civic politics locally (something repeatedly denied by Mr. Donnelly and described by two local pundits in the Tri-City News as a “Red Herring”). 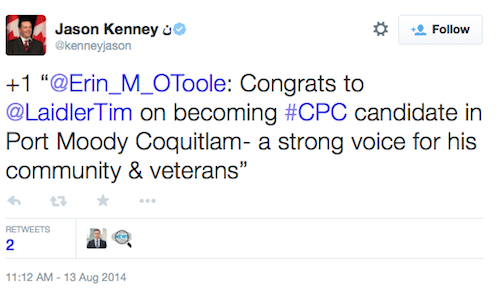 I had no idea that the Conservative Party of Canada was so concerned about civic elections. Do they take such an interest in all civic elections? 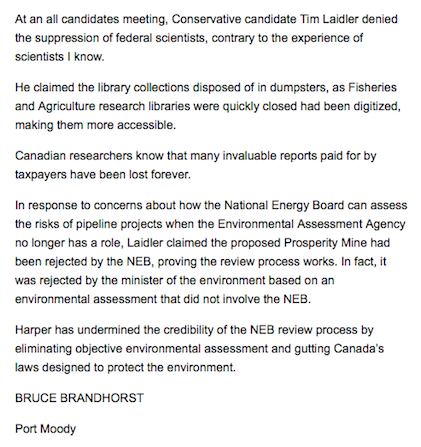 The meddling comment from Mr. Laidler is especially rich coming from Mr. Laidler considering that Mr. Laidler himself as the declared Conservative candidate at the time for the riding had meddled in civic politics by repeatedly posting tweets to local media concerning the local election thereby clearly meddling in local politics. The comment is also a bit rich considering that one of the members of the Executive of the local Conservative riding association appears to have been heavily involved in the “NoSlateTriCities” print and social media campaign during the last civic elections in Port Moody and Coquitlam as detailed here which incidentally appears to have been largely funded by local developers including Wesbild, Polygon Homes, etc. Then there was the revelation that Mr. Laidler hired as his campaign manager for his nomination campaign a consultant who works for Kinder Morgan. 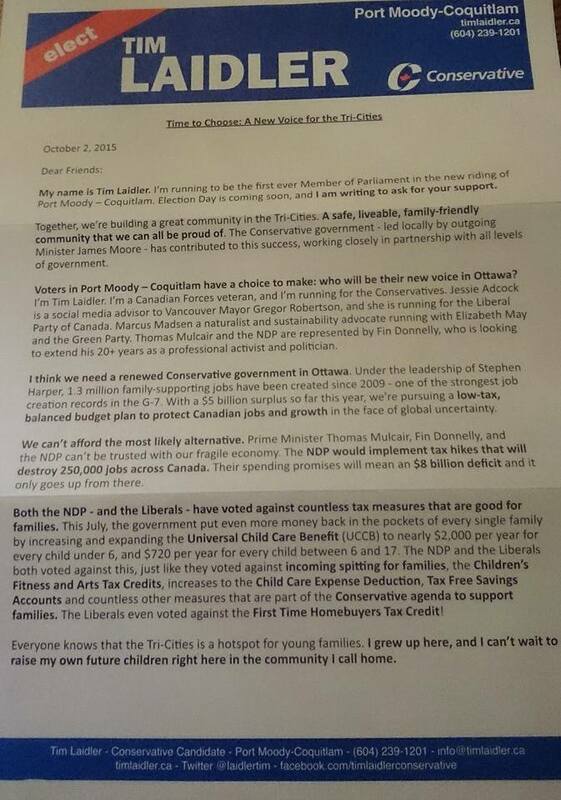 Most recently, it appears that an official letter was recently sent out from Tim Laidler’s campaign (dated Oct 2. 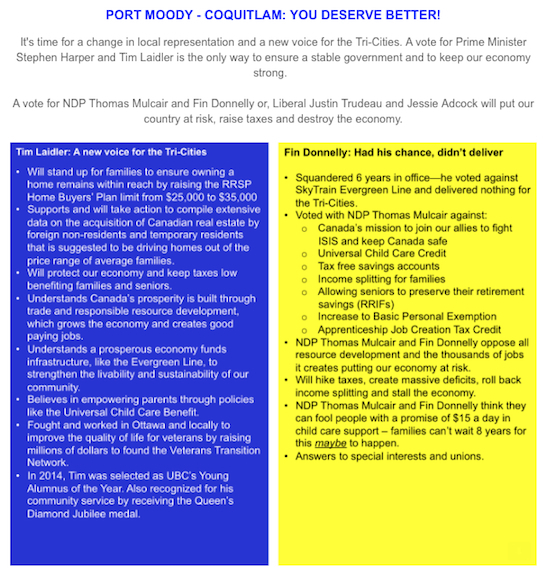 2015) (see below) asking for support for Mr. Laidler but which also contained misleading information regarding the other candidates in the riding and which also talks about “income spitting” (rather than income splitting presumably) (see second to last paragraph). While I know that “income spitting” is obviously a typo and I’m sure that there are many, many on this blog (believe me I know as I keep finding them all the time), this letter represents an official communication from an official Federal party during an election. Surely someone could have proofread and fact-checked the letter before it left the office? Then again, I suppose if the Conservative party HQ can do it as seen below (see below) and the PMO can do it (see below), why would we or should we expect any different from the party at the local level? With less than a week left in the campaign, I’m going to have to keep this blog post open and update it as we go in order to accommodate additional gaffes. Don’t get me wrong though as there have been many positive highlights for Mr. Laidler in the campaign including repeated endorsements from high level Conservative party members including the Prime Minister himself and being able to work with one of the largest war chests in the country (search here if you are interested). It remains to be seen though whether Mr. Laidler and his campaign can pull the current campaign out of its current tailspin and secure a victory despite all the numerous gaffes detailed above. 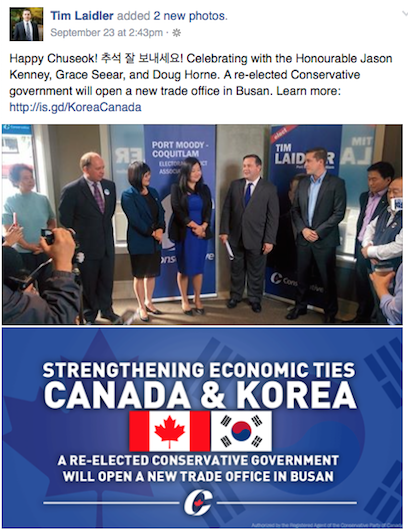 Some of the obvious pandering announcements targeted at least in part to the sizable local Korean population in the riding and various other efforts at vote pandering to the Korean community (such as that below) may help. Stranger things have happened and you can never, ever underestimate the Conservative war machine especially in an area that has traditionally voted Conservative. You do so at your own peril as we have seen repeatedly over the past few elections. Will a campaign with a decided focus on doorknocking be able to overcome a mean-spirited, fear-based campaign on the part of the Conservative Party and their leader Stephen Harper? That remains to be seen. Up to you Tri-City voters. The seal training has already begun if that is what you are looking for. 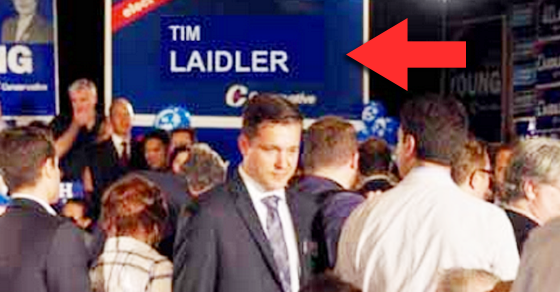 Press Progress just posted (on September 23rd) a comical post highlighting what appears to be a farcical attempt by Tim Laidler’s campaign to Photoshop Tim Laidler’s name over another Conservative candidate’s sign for promotional purposes. Have a look here. Below is the original context of the photo in question. Vancitybuzz.com also subsequently posted on the same topic. It’s all very funny until you consider this: If Mr. Laidler is willing to be part of something like this during an election campaign, what would he be capable of should he ever make it to Ottawa? Some food for thought. 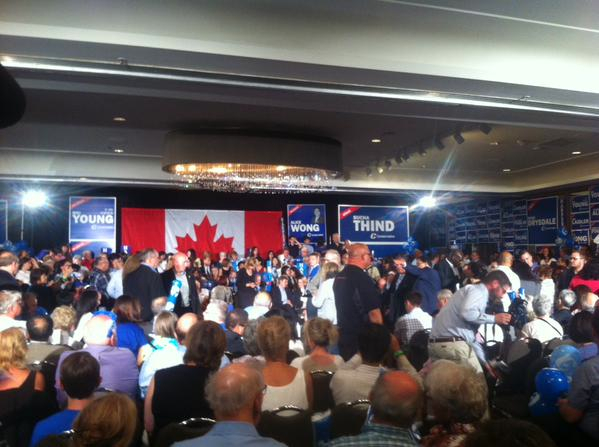 Some more photos from the event showing the Thind sign present. What this incident shows is that if reality doesn’t fit and it suits you as a Conservative, just Photoshop it (badly) and make it part of the new Conservative reality. Maybe no one will notice? Again, if people like this are willing to do these kinds of actions as part of an election campaign (and against a candidate from their own party no less), what would they do once in Ottawa? Why would we ever let them back into Ottawa? We have already seen that ethics are not the Conservatives’ strong point. Fool me thrice? 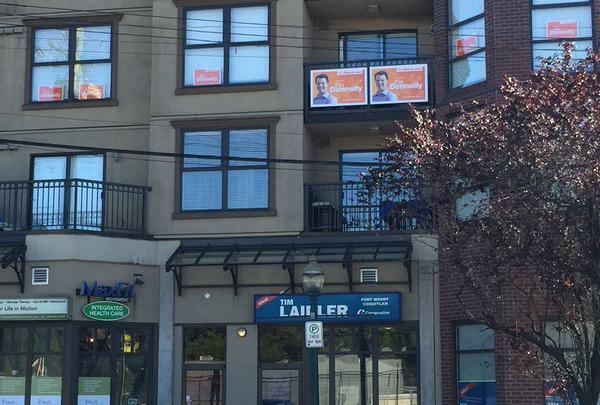 UPDATE: A representative from Tim Laidler’s election campaign has confirmed to Vancity Buzz that a communications volunteer did in fact photoshop Laidler’s name over top of another candidate’s sign, but that “no harm or misrepresentation was intended”. “…no misrepresentation was intended”? Really? Looks exactly like intended misrepresentation to me. I must say that I do feel for the communications volunteer in question as that probably was not a good day for them (when the graphic came to light and the posts began to appear). However, that said, the fact is that there is no way that that graphic like that should have left the office. It is a failing of the campaign manager and the candidate in question to not attend to and/or review everything that leaves the office with the candidate’s name on it. It is not a failing of the communications volunteer as I’m sure they were only trying to help. The incident instead speaks to poor internal communications and a lack of attention to details, something that you would hope someone seeking office at the highest level would be good at. Identifying the source of the graphic as a communications volunteer also speaks to a lack of taking responsibility for the campaign by those in charge. The campaign essentially just hung the volunteer out to dry. For the communication volunteer, that must not have felt very good. Not cool. 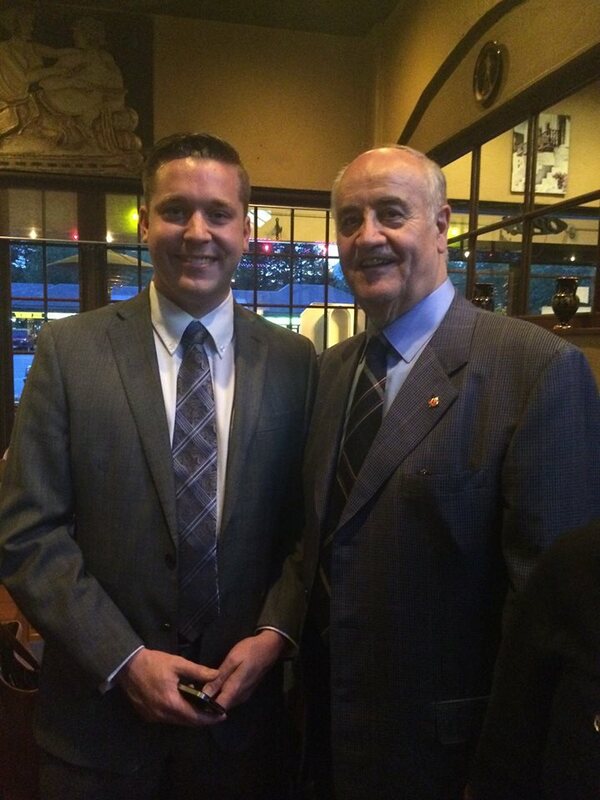 Conservative Candidate (and Reservist at the time) Tim Laidler with the then Minister of National Defence Julian Fantino, May 21, 2014. Subsequent to the publishing of the post Parliamentary Testimonies and Unintended Consequences, in order to follow up and confirm various details concerning the timeline of Mr. Laidler’s candidacy for the Conservative Party in the newly established riding of Port Moody-Coquitlam and how it relates to his time in the Reserves, I decided to submit a second FOI request to DND. My primary goal in submitting the second FOI request was to obtain third party confirmation of Mr. Laidler’s retirement date from the Reserves as an interested party had informed me that they had been told by official sources that Mr. Laidler had indeed retired from the military but that his effective date of retirement remained unknown. Confirming when (and ultimately if) Mr. Laidler had retired from the Reserves would help to identify exactly how long his candidacy for the Conservative Party was potentially in breach of 15.3.4.3 of the DND and CF Code of Values and Ethics. 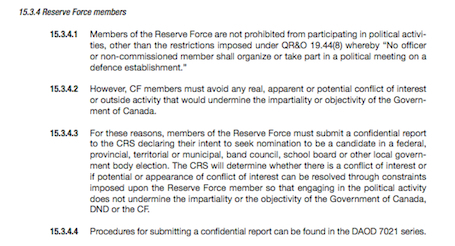 As a backgrounder, as a Reserve Force member, according to section 15.3.4.3 of the DND and CF Code of Values and Ethics “…members of the Reserve Force must submit a confidential report to the Chief Review Services (CRS), declaring their intent to be a candidate in a federal, provincial, territorial, or municipal, band council, school board, or other local government election body election.” Section 15.3.4.3 also states that, “The CRS will determine whether there is a conflict of interest or potential or appearance of conflict of interest that can be resolved through constraints imposed upon the Reserve Force member so that engaging in the political activity does not undermine the impartiality or the objectivity of the Government of Canada, DND, or the CF.” I’ve clipped the section in the Code of Values and Ethics concerning reserve force members and political activities and have provided it below. 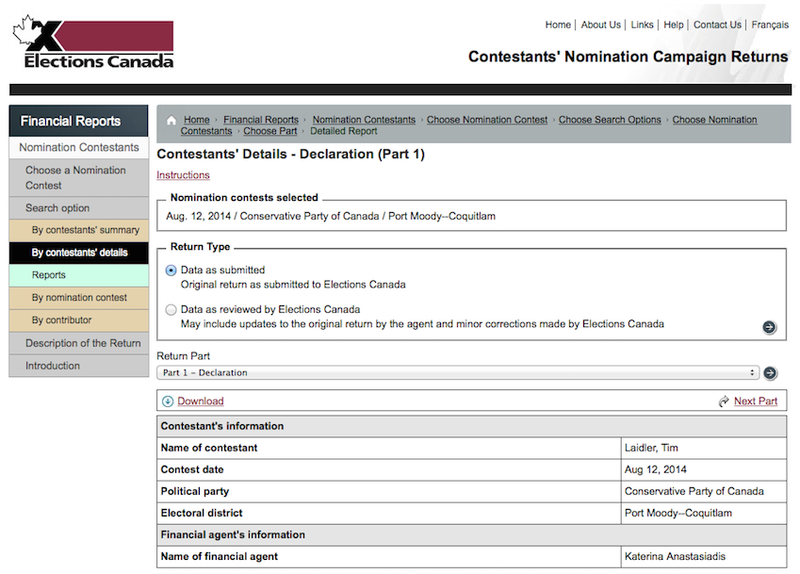 In my initial FOI request I was specifically interested in determining if Mr. Laidler had indeed declared his intent to the CRS to be a candidate in the Federal Election prior to and/or after his acceptance of the nomination in the riding of Port Moody-Coquitlam on August 12, 2014 and if so, if the CRS had determined whether or not there is/was a conflict of interest or potential or appearance of conflict of interest in Mr. Laidler seeking Federal office and if any constraints were imposed on Mr. Laidler as described in Section 15.3.4.3 of the DND and CF Code of Values and Ethics (2012) so as to avoid a conflict of interest or the potential appearance of a conflict of interest. The result of the FOI request is provided below. 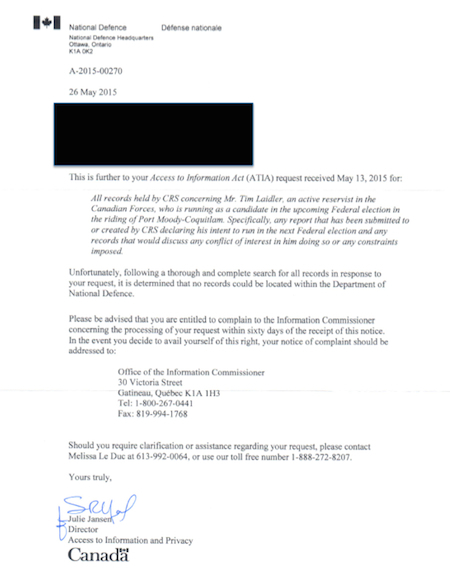 As is apparent from the results of the original FOI request, it appears that there is no record of the confidential report ever being submitted by Mr. Laidler to CRS. This therefor suggests that from the date that he submitted his application to be a Conservative candidate in the upcoming Federal Election up to his date of retirement from the Reserves, that he was potentially was in breach of the DND and CF Code of Values and Ethics (2012) and, while still in the military, he would have been possibly subject to Queen’s Regulations and Orders Volume II Disciplinary (or in laymen’s terms), meaning that he could have been potentially be subject to discipline for his actions had his candidacy for the Conservative Party had been brought to the attention of the appropriate DND and CF authorities during the time that he was still a Reserve Force member. Any records held by DND that show that Mr. Tim Laidler has released, has submitted a request for release, and/or is in the process of releasing from the CF. The documents will show the effective release date and the date the subject member submitted the request for release. The wording of the FOI request was suggested to me by the DND FOI folks themselves after a few back and forth email exchanges. Originally I was informed on the phone that there was “no problem” in requesting Mr. Laidler’s service records as they do that all the time. The results of my FOI request can be found here. For those not willing to download the physical document itself, I can easily describe it for you. The FOI request generated a 37 page document of which 36 pages were withheld according to Section 19(1) of the Access to Information Act. 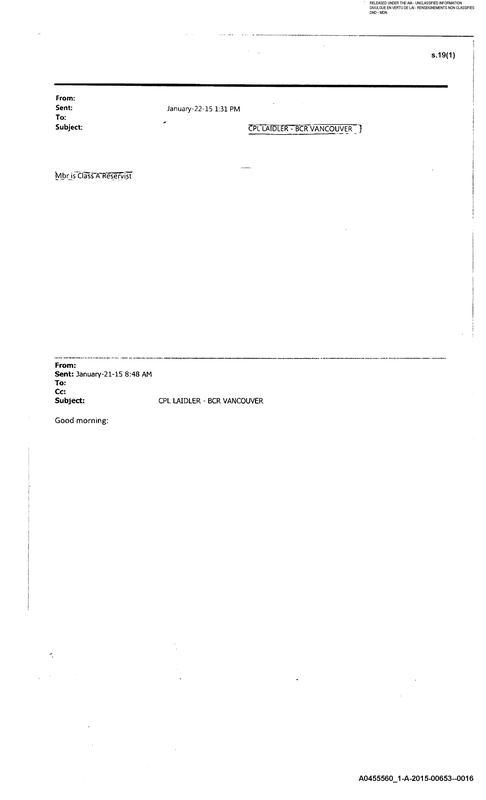 The only page that was actually provided to me and which also had clearly been heavily redacted (see below) consists of the record of an email exchange that took place on January 21 and 22, 2015 which suggests that on the latter date (January 22, 2015) that Mr. Laidler was (at least as of that date) a Class A Reservist (note the present tense “is” in the email). This suggests that at least up to January 22, 2015, Mr. Laidler was still in the Reserves meaning that up to that date it does not appear that he followed the rules regarding his candidacy as outlined in Section 15.3.4.3 of the DND and CF Military Code and Ethics (2012). The results of the FOI would suggest (given that it occurred less than two months later), that it is indeed very likely that Mr. Laidler didn’t “misspeak” when he testified before the Standing Committee on Veterans Affairs on March 12, 2015 and that he indeed was very likely in the Reserves at that time as he stated in his testimony (see below). Possibly, but I can’t say for sure. Unfortunately given the time delays inherent in submitting FOI requests, there is probably not enough time to get an appeal submitted, processed, and returned before the upcoming election takes place. 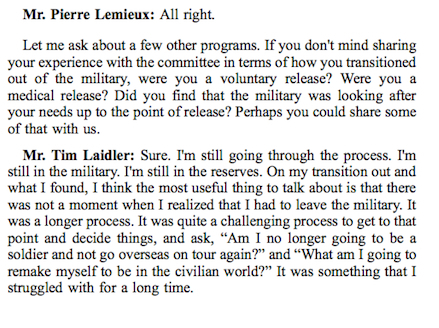 that Mr. Laidler without identifying himself both as a candidate for the Conservative Party and an active reservist, (1) participated in his candidacy for the Conservative Party, (2) testified to a parliamentary committee on Veterans Affairs, and (3) conducted newspaper interviews supporting the Conservative government and their treatment of veterans (such as the one here on Nov. 23, 2014 where he suggested that the Conservative government is the best ally of veterans or this Oct. 1, 2014 Toronto Sun Article in which he lauded the Conservatives and their treatment of veterans while apparently failing to mention that he was both a Conservative candidate and an active reservist at the time of the interview). During the time that he was participating in these activities, it appears that he was in breach of Section 15.3.4.3 of the DND and CF Code of Values and Ethics. 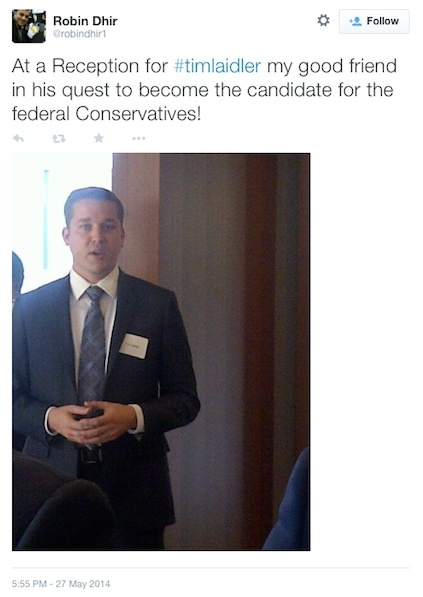 There is an obvious conflict of interest apparent in participating in these activities without full disclosure of both his candidacy for the Conservative Party and his status as an active Reserve Force member. One wonders if Mr. Laidler had actually submitted the requisite report under Section 15.3.4.3 of the DND and CF Code of Values and Ethics whether or not restrictions would have been placed on his candidacy due to the potential of a conflict of interest or a potential perceived conflict of interest as that indeed is exactly what the rules associated with the DND and CF Code of Values and Ethics are there to protect against. Would he have been allowed by DND to testify before the standing committee on Veterans Affairs and/or conduct interviews while still simultaneously being a Reservist and a declared candidate for the Conservative Party? Would one of his conditions of candidacy have been that he would have had to identify himself both as an active reservist and a Conservative candidate at all times? Unfortunately, we will never know as it appears that the CRS was never provided the opportunity to comment on his candidacy for the Conservative Party as required. 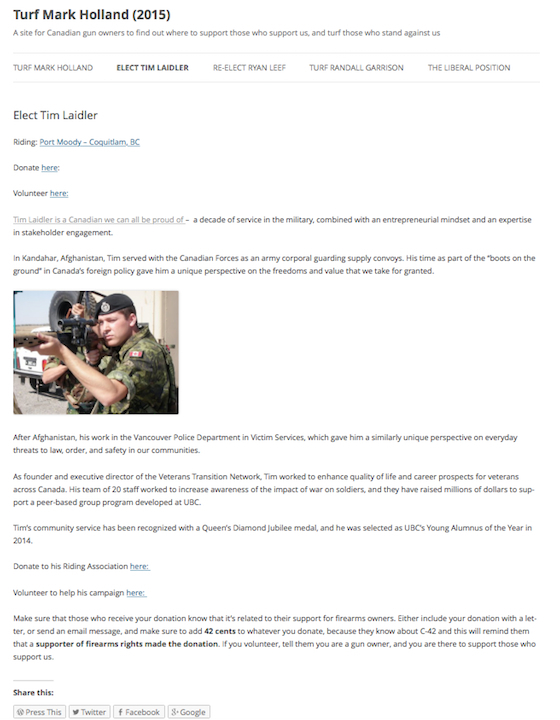 As Tim Laidler’s candidacy for the Conservatives in the new riding of Port Moody-Coquitlam is largely focused on him being formerly in the military (see his campaign website here http://www.timlaidler.ca) and him being a supporter of the Conservatives’ record on the military, veterans, and veterans affairs, I thought it was only fitting and appropriate to bring attention to what exactly Mr. Laidler was, and is, supporting. 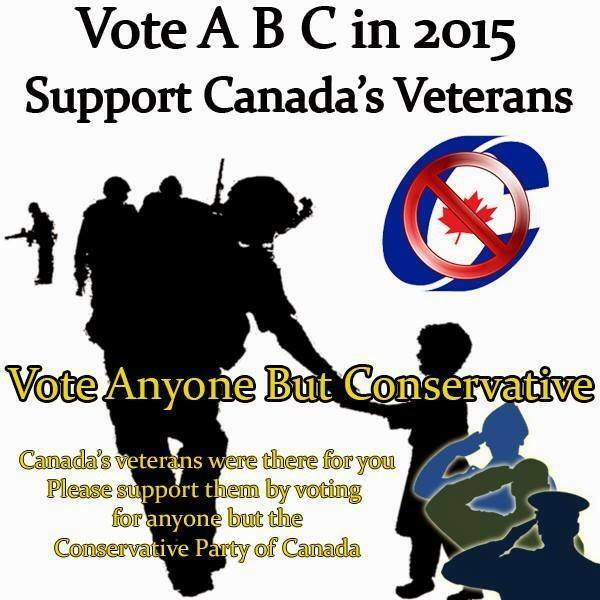 A group of veterans recently launched the Canadian Veterans ABC Campaign 2015, a campaign designed to ensure that the Conservatives do not retain their majority in the next election and to ensure that Canadians voters are aware of the treatment that veterans have received from the Conservatives under Harper. As part of their campaign, the group compiled a list detailing the poor treatment of Canada’s veterans called Harper’s Record: The Terrible Treatment of Canada’s Veterans by the Conservative Government of Stephen Harper. 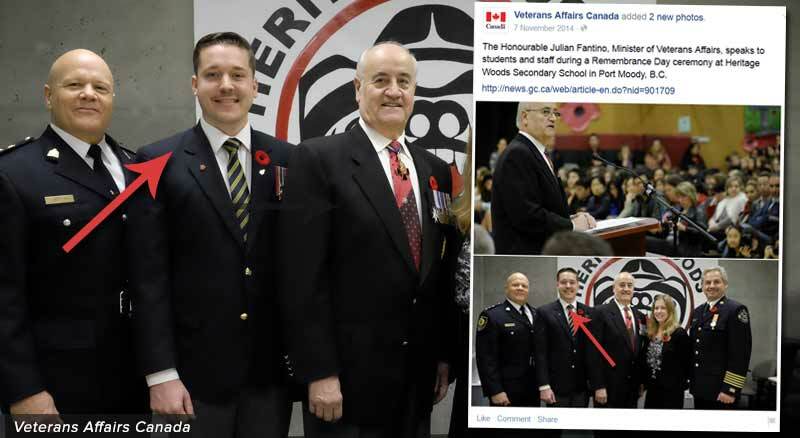 Some of these items were also presented in the earliest post Embattled Fantino dumped from Veterans Affairs. I would encourage you to read the full document produced by the group as it is both eye opening and shocking. I would also encourage readers to read the recently published article in the Tyee entitled ‘You Have Forgotten’: Seven Conservative Attacks on Canadian Veterans. Despite the extensive list of complaints compiled by this group and others, Mr. Laidler has suggested in the past that complaints about Veterans’ treatment were “coming from a vocal minority and, in some cases, from partisan groups“. 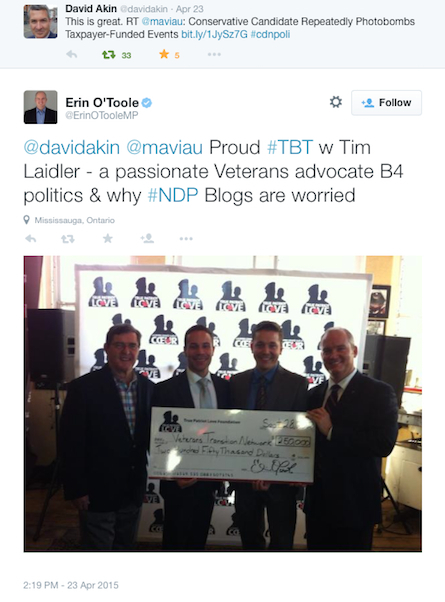 Mr. Laidler was also quoted in a Oct. 1, 2014 Toronto Sun article lauding the Conservatives and their treatment of veterans again failing to mention that he was a Conservative candidate at the time of the interview (again a constant theme of Mr. Laidler’s candidacy). The latter article particularly annoyed a number of people in the veteran community and was in fact sent to me by a fellow veteran who was at the time of the publishing of the article, dismayed that Mr. Laidler was expressing support for Mr. Fantino and the Conservative government. See the article “Afghanistan veteran remains loyal to Conservatives amid protests for support” for additional details concerning Mr. Laidler’s support for the Conservatives. 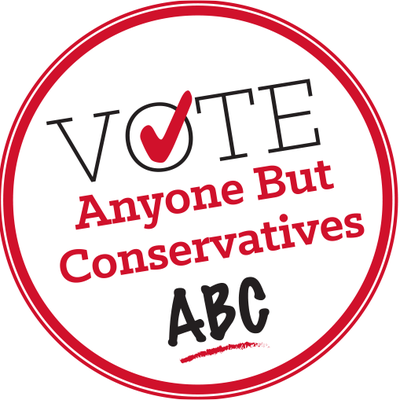 In contrary to Mr. Laidler’s assertions regarding veterans generally being supportive of the Harper Government’s treatment of veterans, the Anyone But Conservatives ABC – Canadian Campaign Facebook Page has over 12,000 likes, the ABC Veterans Canada Facebook Club has over 1,000 members (describing itself as the Internet’s “largest veterans virtual social club”), and the Veterans with PTSD Facebook page has over 800 likes, all of these sites have a decidedly anti-Conservative tone. It could be suggested that this is hardly what one would describe as a vocal minority. 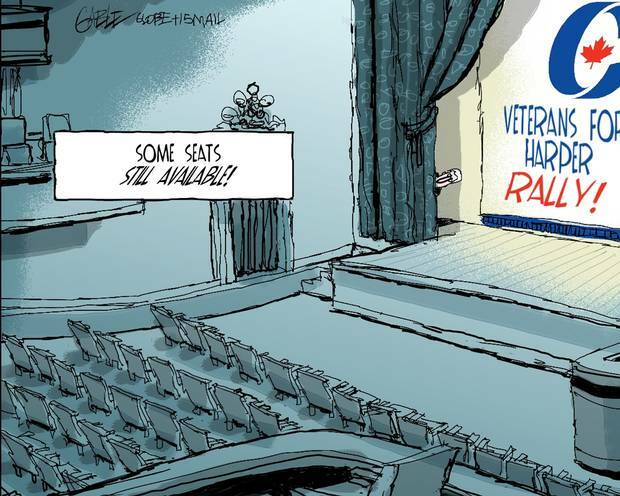 If the vast majority of veterans of this country were so supportive of the government and the treatment that they received from it, where are the “Veterans supporting Harper” or “Veterans supporting the Conservatives” Facebook group and webpages? Try a Google search with “Veterans supporting Harper” or “Veterans supporting Conservatives” and see how many positive hits you get. Instead, what you get are results such as Harper government spent $700,000 fighting veterans in court, Veterans Affairs’ unused funds total $1.13B since 2006, links to a press conference in which veterans expressed their concerns with the Veterans Affairs Ministry run by Mr. Fantino, stories about veteran amputees who have to prove their disability annually, etc. Moreover, why is it so hard to find veterans willing to do commercials supporting Harper’s treatment of veterans if in fact they actually did treat them so well? 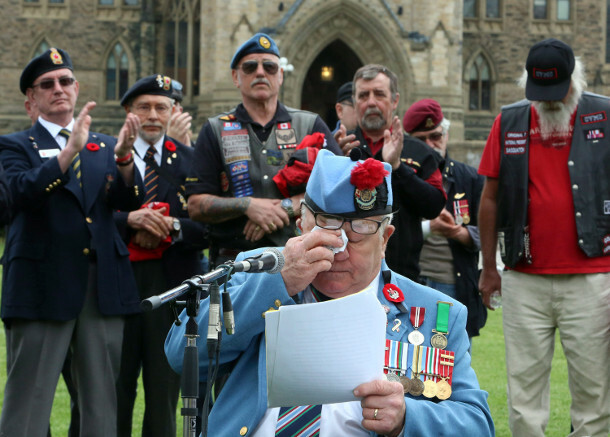 his positive testimony of the treatment of veterans twice before parliamentary committees (again refusing to identify himself as a Conservative candidate during the testimony as detailed in the post Parliamentary Testimonies and Unintended Consequences), and his statement that the Conservatives are the best ally of veterans, Mr. Laidler’s support for the Conservatives treatment of Veterans could be interpreted as a case of political partisanship clouding his judgment despite extensive evidence to the contrary. Is this what we want from our representative in Port Moody-Coquitlam? If elected, would Mr. Laidler allow his political partisanship cloud his judgment in other areas too if he does so in an area that he knows in intimate detail? Could we expect Mr. Laidler to stand up to Mr. Harper in defense of the riding of Port Moody-Coquitlam and the people of B.C. in any matter for that matter or would he just be another “clapping seal” that we in B.C. 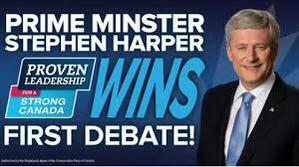 send to parliament as Harper’s representative in our riding rather than our representative in Ottawa. 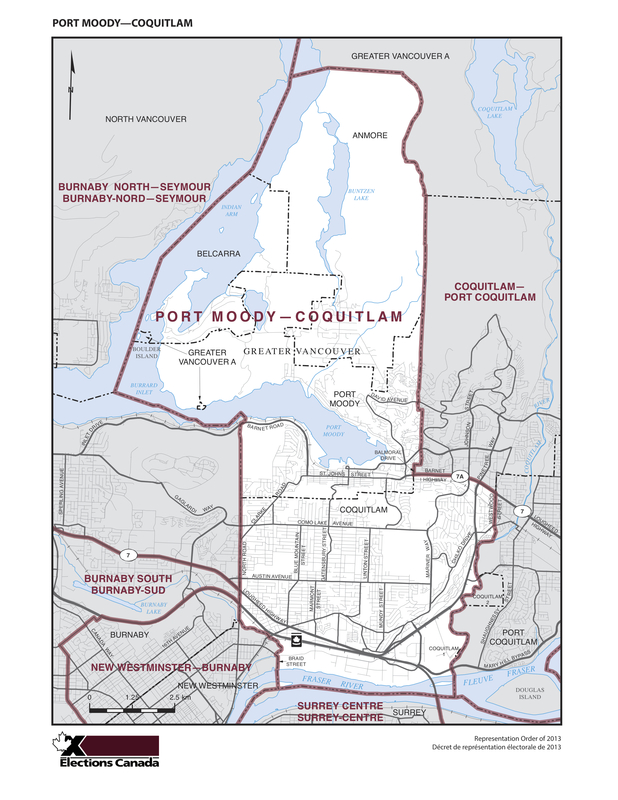 Ultimately it will be up to the constituents of the riding of Port Moody-Coquitlam to decide. Edit: It appears that a Veterans for the Conservatives Facebook Page has now been established. Interestingly, the first activity for the Facebook page was on August 18, 2015, the day that this blog post was first posted. Coincidence?